Three Americans who stopped a terror attack on a train to Paris in 2015 will star in a new Clint Eastwood’s movie. Anthony Sadler, Alek Skarlatos and Spencer Stone will play themselves in The 15:17 to Paris, based on the book they co-wrote with Jeffrey E. Stern. Actors will play younger versions of the trio in the film, which is thought to focus on the three men’s friendship. 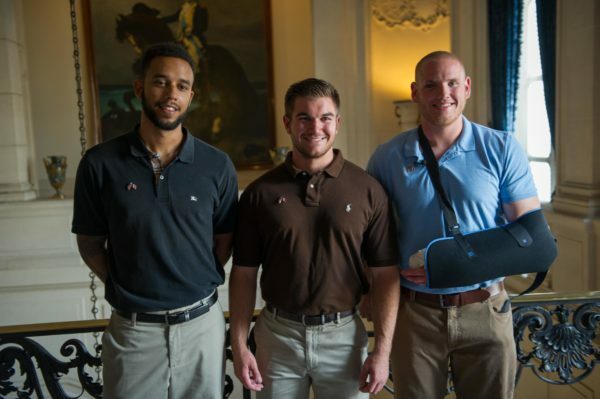 Anthony Sadler, Alek Skarlatos and Spencer Stone were awarded Legion d’honneur medals for their actions. They also received a hero award from Clint Eastwood himself at an awards ceremony in 2016. The three men were among a number of passengers who overpowered a heavily armed man who had opened fire on the train. Spencer Stone and Alek Skarlatos were both off-duty servicemen, while Anthony Sadler was a student at California State University. The man they apprehended was later named as Ayoub El-Khazzani, a Moroccan believed to have had links to radical Islam. The 15:17 to Paris is the latest film in a series of movies Clint Eastwood has made based on real-life people in extraordinary situations. Clint Eastwood’s last movie, Sully, told of pilot Chesley Sullenberger, who landed his damaged plane on the Hudson River in 2009. If made, The 15:17 to Paris will not be the first fact-inspired movie to feature non-actors in leading roles. In 2012 release Act of Valour, real-life Navy Seals were shown embarking on a fictional covert mission. There is a tradition, meanwhile, of the subjects of Hollywood biopics appearing in the movies they inspired. Are Amazon Going to Solve a Murder?